Once you get his leash out, he will dance around like this THE most exciting thing that has EVER happened to him. He will then jump around so much that it's almost impossible to get his collar on his chunky neck. Then he will bolt down the stairs and out the garage at warp (basset) speed. Even though no steps have been taken, as you are closing the garage door he will begin to pant. As you cross the driveway the pace will slow and the panting will gain. Crossing the street to the sidewalk will provide a slight uptick in his speed. Then something will catch his nose and STOP. Once every blade of grass in those 3" has been sniffed, the walk will continue. With the pace of a snail, approximately .25 miles will be covered in 10 minutes. 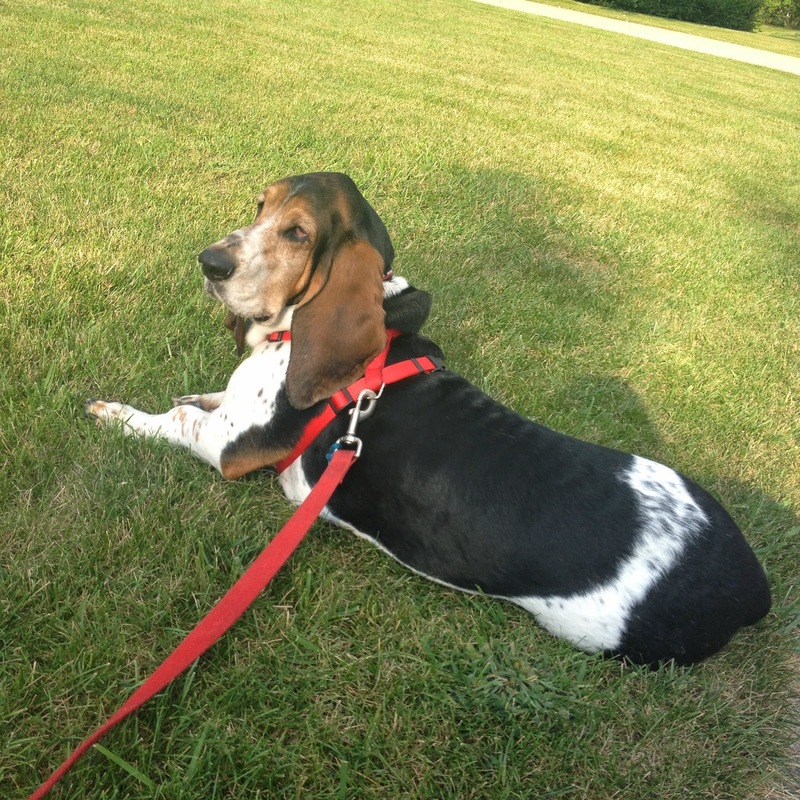 Once the luscious, soft sod grass by the pool has been reached, the basset must. lay. down. And lay down he will. Don't think about trying to move the basset because he will throw all of his body weight down and become dead weight. You may try tugging, dragging, bribing and none of these will work. The basset will rise when he's ready. When the master basset decides he's ready to go home, he will pop up and trot home happy as a lark to be done walking. 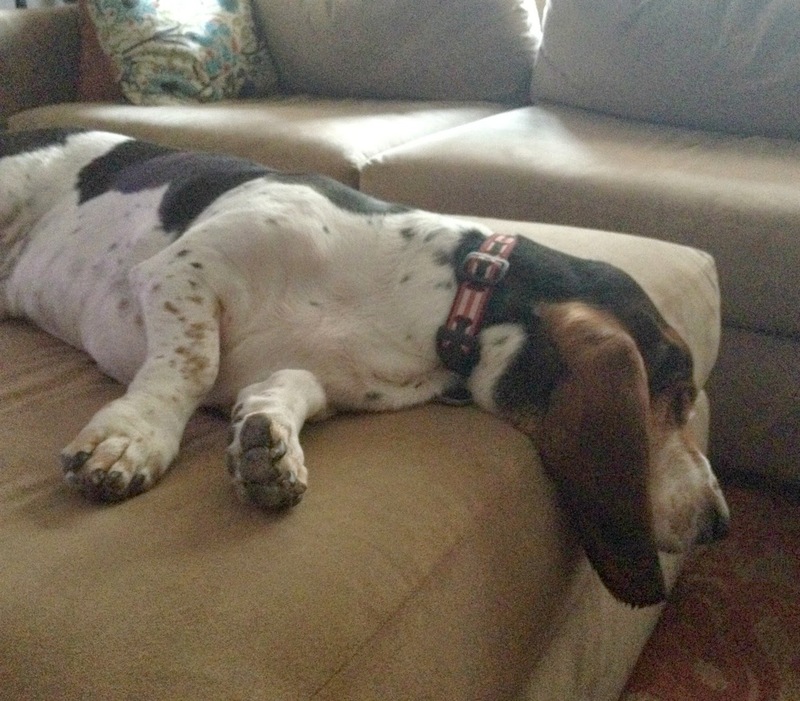 Once home the basset will immediately FLOP and proceed to lay for at least 10 minutes. Walking less than .5 mile is incredibly strenuous, you know. Floyd is such a rascal! Fletch does the happy dance when we put our shoes on. I feel sorry for him when we are putting them on to leave, not walk him! Hahaha..this is the sweetest. Our neighbors have a basset hound and even just to run across the street when I call his name, he has to stop for a brief second and sniff something or gets distracted. lol So cute! God love him! It sounded like a good idea at the time, huh Floyd...? I love that Basset! My Dad loves how lazy bassets are. He swears he would only get another dog if it was a basset. Sending this to him now! Awwww!!! He's so tired at the end of his walk! I do love me some Floyd. I showed all my friends this weekend the video of floyd refusing to walk with you. hilarious!!!!! This is the cutest post! Love the wording and the obvious love you have for your "baby." This is hilarious! Bless his little basset heart.